While medieval architects were lauded and studied during the Soviet period, Azerbaijani architects from the capitalist period were ignored and forgotten. In fact, during the Stalinist era, their names could not even be spoken. On a walking tour in Baku, you're likely to see a wide variety of buildings: stone fortresses, magnificent palatial residences and medieval mosques as well as modern apartment buildings, modern bank buildings and hotels. In the midst of the hustle and bustle of modern life, there is the wonderful sensation that you are surrounded by history. Yet, surprisingly few Azerbaijanis know the history behind the city's older landmarks, including the Maiden's Tower and the magnificent mansions that were erected during the late 19th century and early 20th century. Many of the details concerning these buildings were hidden or distorted during the Soviet era, especially regarding those buildings erected during the "capitalist era", the Oil Boom that preceded Communist rule (1920-1991). Left: View at the back of Maiden's Tower with its archeological layers juxtaposed with the newer and refurbished examples of architecture that have been cropping up this past decade in the Old City. 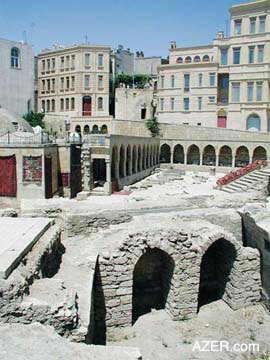 Azerbaijani historians are now piecing together the history of Baku's architecture using accounts and records stored in historical archives such as Baku's Institute of Manuscripts. Here Dr. Farid Alakbarov presents some of their recent discoveries in an era-by-era survey of Baku's architecture. The Maiden's Tower is one of Baku's most prominent and striking monuments. It has a unique shape: a cylindrical, eight-story stone tower attached to a large stone ledge, or what might be called a "tail". From the air, you might say it looks like a giant. The origins of the Maiden Tower remain a mystery to this day. Azerbaijani historians still debate even the most basic questions about it, including: When was it built? What was it used for? Why does it have such a peculiar shape? When Soviet archeologists and historians researched the Maiden's Tower, they identified it as a military fortress that had been built in the 12th century by architect Masud ibn Davud, whose name was found on a stone that had been inserted into the wall. Later, historian Sara Ashurbeyli proved that the stone was merely a broken tombstone that had been used to repair the tower. Most likely, Masud ibn Davud wasn't even an architect and had no relation to the tower. After Azerbaijan gained its independence (late 1991), architectural historian Shamil Fatullayev wrote in his "Architectural Encyclopedia of Baku" (1998) that the tower dated back at least 1,300 years ago to the pre-Islamic period. Professor Davud Akhundov has developed another striking theory. He believes that the tower was never used for military purposes but rather served as an ancient Zoroastrian fire-worshipping temple. 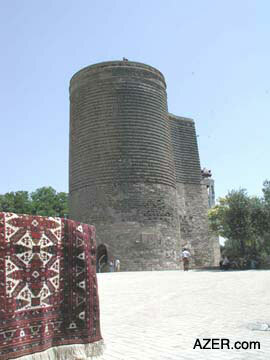 Akhundov writes in his book "Architecture of Ancient and Early Medieval Azerbaijan" (1986, Baku, p. 287): "At the beginning of the 1st millennium BC, there was raised an eight-storied towered temple (Maiden's Tower), devoted to seven Gods, grandiose for those days: there were seven sacred levels, wall recessed altars with seven-colored fires burning in honor of the Pantheon of Gods of Ahura Mazda or Mithra." Left: Historians are still debating the mysterious origins of the Maiden's Tower, one of Baku's most familiar landmarks. While no one knows for certain why the Maiden's Tower was built, we now know that it was not built in the 12th century, but rather many centuries earlier. The medieval Shirvanshah Palace is an important symbol for Azerbaijanis, as it reminds them of Azerbaijan's history as an independent state. Some chauvinist academics in the USSR tried to prove that Azerbaijan never had its own state but was ruled by other nations like Russia and Persia up until 1918. In fact, some misinformed Azerbaijanis and foreigners continue to believe this today. However, all of the historical evidence, including this Palace, proves that Shirvan (Northern Azerbaijan) was an independent state for 700 years, from the 9th century to the 16th century. The Palace in Baku was erected in the 15th and 16th centuries by the Shirvanshahs, the rulers of the Shirvan state. It was the only large ancient palace in Azerbaijan that was not destroyed by invaders during the Middle Ages. Within the Palace complex, there is a two-story main building, which once held an elaborate gold-plated throne. In front of the main building stands the mausoleum of 15th-century scholar Seyid Yahya Bakuvi. A nearby building called the Divankhana (Court of Law) features portals that are adorned with beautiful stone carvings. The lower yard of the Palace contains the burial vault of the Shirvanshahs as well as a mosque and the remains of an ancient bathhouse. The Shirvanshah Palace was not used as an actual palace for long. In the 16th century, Baku was captured by Shah Ismayil Safavi from the city of Ardabil in Southern Azerbaijan [now Iran]. He completely conquered the Shirvan state, killed the ruling shah dynasty and burned some of the buildings of the Shirvanshah Palace complex. In the 19th century, Russian soldiers used the Palace's main building as barracks. One of the two mosques was used as a military arsenal, which exploded in 1918. Today only one mosque remains on the Palace grounds. Left: Bak Sovet which serves as the Mayor's office was built in 1900-1904. During the Soviet period, the Shirvanshah Palace was used as a Museum. Today, the Museum and its buildings are closed, and the Palace is under extensive renovation. Unfortunately, a lack of financing has brought this reconstruction to a halt. Medieval Azerbaijani architects were relatively well researched during the Soviet period. One of the most distinguished was 12th-century architect Ajami ibn Abubakir, sometimes known simply as Ajami Nakhchivani. Recently, a Metro station in Baku was named in honor of him. Ajami Nakhchivani erected a large, tower-shaped mausoleum in Nakhchivan that is decorated with stone carvings and glazing. He built the mausoleum in 1186 in honor of Momine Khatun, the wife of Sultan Muhammad Jahan Pahlavan of the Eldaniz dynasty, who ruled Southern Azerbaijan and Nakhchivan. Ajami Nakhchivani was also known for building the Yusuf ibn Kuseyir Mausoleum in Nakhchivan. Other important Azerbaijani architects from the 13th and 14th century include Zeynalabdin Shirvani, Mahmud ibn Magsud, Abdul Momin Tabrizi, Jamaladdin, Haji Alishah Tabrizi, Omar, Nizam Tabrizi, Tajaddin and Arif. Historians of the Soviet period researched famous 13th-century Baku architects like Abdul Majid, who built the Mardakan Tower, and Mahmud ibn Saad, who built the Nardaran Tower in the vicinity of Baku. We also know that Azerbaijani architects and builders participated in the construction of the Taj Mahal in India and many other architectural projects in Central Asia and the East. While these medieval architects were lauded and studied during the Soviet period, Azerbaijani architects from the capitalist period were ignored and forgotten. In fact, during the Stalinist era, their names could not even be spoken. Once Azerbaijan became independent, scholars like Shamil Fatullayev researched the work of talented architects from the late 19th and early 20th centuries. Fatullayev issued his "Architectural Encyclopedia of Baku" in 1998, highlighting the work of long-forgotten architects like Gasim Hajibababeyov, Mashadi Mirza Gafar Ismayilov, Zivar Ahmadbeyov, G. Akhundov, Omar Abuyev, Ismayil Gajar and Mirza Hasan Hajinski. During the Soviet period, however, Russian architects received all of the credit for rebuilding and modernizing the medieval fortress - city of Baku. Granted, when Baku became the capital of the Baku Province of the Russian Empire in 1859, Russian architects did introduce new Western architectural styles there, such as Baroque, Gothic, Renaissance, Modern and Mauritanian. Left: Many names of the owners and architects have long been forgotten as it was dangerous to talk about capitalists during the Soviet Period. However, Azerbaijani builders also contributed significantly to this work. Most of the planning and construction activities were carried out by Gasim Hajibababeyov (1811-1874) and Mashadi Mirza Gafar Ismayilov. From 1862 to 1867, Hajibababeyov built up the coastal region of central Baku, which is now considered the most beautiful part of the city. He founded the coastal park, created a water supply system and built numerous fountains. He also developed the plan for the shaded Tsitsianov Garden, one of the central parks of Baku. Hajibababeyov designed the central square of the city - the Parapet, now known as Fountain Square. In 1868, he built a large caravanserai near this square; it is now the Araz movie theater. Russian, Polish and German architects such as Goslavski, Ploshko, Eichler and Von Der Nonne also played an important role during the pre-Soviet period, erecting a number of architectural masterpieces in Baku, including the Baku City Hall, the Mukhtarov Palace, the Taghiyev Palace and the Ismailiyya Palace. Many of the magnificent buildings that were built in the late 19th century and early 20th century were funded by Azerbaijan's first major Oil Boom. However, the businessmen and oil barons who built these buildings were rarely mentioned during the Soviet period. Before Azerbaijan became independent, many of its citizens had no idea who had built the grandiose houses that line the streets of Baku. Azerbaijani businessmen and philanthropists such as Taghiyev, Naghiyev, Asadullayev, Mukhtarov, Ashurbeyli and Guliyev may have changed the face of Baku's architecture, but their efforts were scorned during the Soviet period. 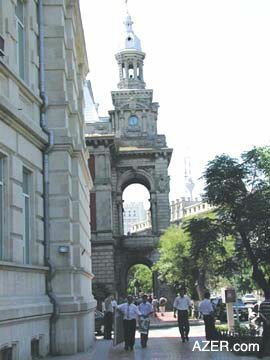 Left: Many of Baku's prominent government buildings, such as the Academy of Sciences, have recently undergone reconstruction. It wasn't "politically correct" to mention them. Historians wrote that the capitalists in Baku built luxury palaces while the workers and peasants lived in poverty and suffered from hunger and disease. Usually, these historians did not reveal that the oil barons had also built schools, libraries and hospitals to help the poor. If these deeds were mentioned, they fell into the category of "the hypocrisy of the ruling class." While oil barons made a huge profit out of the workers' labor, the Soviet historians said, they paid out only a tiny portion of the income in the form of salaries and philanthropy projects. Oil baron and philanthropist Haji Zeynalabdin Taghiyev constructed numerous buildings in Baku, including the opulent Taghiyev Residence, which now houses the National History Museum. The Taghiyev Residence was constructed in 1893-1902 by Polish architect Joseph V. Goslavski (1865-1904) and occupies an entire city block. Due to damage that was sustained from Baku's earthquake last year, the building is currently closed for repairs. Taghiyev worked to provide education for poor Azerbaijanis and women. With this purpose in mind, he built a beautiful boarding school for Muslim girls in the central part of Baku in 1898. This three-story, Mauritanian-style building was the first girls' school in the Muslim East. Goslavski was the architect of this Taghiyev-funded building as well. Not everyone appreciated Taghiyev's efforts, however. Though Taghiyev had secured the approval of Russian Czar Alexander III, some Muslim extremists in Baku tried to stop the school from being built. Left: The President's Aparat was constructed by Heydar Aliyev in the late 1970s. During Perestroika, material related to these events began to surface. It turns out that the fanatics entered the home of Mulla Ruhulla, a friend of Taghiyev who sent his daughters to the school, and killed him while he was praying. Religious extremists gathered in the street and attacked unveiled Azerbaijani women, forcing them to take off their European shoes and put on the black veil [chador]. The schoolgirls and their parents were terrified. Following the advice of Taghiyev, the schoolgirls wrote a letter to Russian Empress Alexandra Feodorovna, thanking her for the permission to open the school. In a telegram, the Empress replied that she hoped the girls would become useful and happy citizens of their native land. After this reply, the fanatics became afraid of inciting the government and did not attack the girls anymore. The school took on the name, "Alexandrian Russian Muslim Female Boarding School." During Azerbaijan's early independence period (1918-1920), Taghiyev presented the school building to the Azerbaijan Democratic Republic (ADR) government. Later, the Bolshevik Parliament functioned there. Today, this beautiful building houses the Institute of Manuscripts. Taghiyev also financed the construction of the Music Comedy Theater, the first European-style theater to be built in the Muslim East. Many of Hajibeyov's operas were performed in this theater. However, during the Soviet period, Azerbaijanis avoided mentioning that Taghiyev had built the theater - it was too dangerous. Now, the theater has been renovated and has become even more beautiful. Another oil baron who contributed greatly to Baku's architecture was Agha Musa Naghiyev (1849-1919). He built the Ismailiyya Palace, one of the most beautiful buildings in Baku, for the city philanthropic association "Jamiyyati-Kheyriyya". The building was named in honor of Naghiyev's son Ismayil, who died in his youth of tuberculosis. Left: Modern Seaview Plaza near Narimanov Square. Naghiyev hired Polish architect I. K. Ploshko, who suggested that he build Ismailiyya in the Venetian Gothic style. The construction was finished in 1913, but five years later, Ismailiyya was burned by Armenian Dashnaks. Azerbaijanis repaired it and placed the ADR Parliament there in 1919. To force the Parliament to capitulate the following year, the Bolsheviks opened fire on the Palace from nearby ships. Fortunately, the building was not destroyed. During the early Soviet period, Bolsheviks removed the quotations from the Koran from the facade of Ismailiyya and replaced them with Communist slogans and golden stars. When the Academy of Sciences moved there, the words "Academy of Sciences of the Azerbaijan SSR" were inscribed along the top of the façade. The large metallic golden stars and letters that were attached to the building as ornamentation have not been removed, though the name of the building near its entrance is now written in Azeri Latin script and English. Even though Naghiyev was considered to be one of the wealthiest oil barons in Baku, he had a reputation among his peers for being somewhat of a miser. For instance, he carefully supervised the construction work at his building sites. He would keep a close eye on his employees and their work, to the point of opening boxes of nails to count all of them himself. According to the late writer Manaf Suleymanov, one winter Naghiyev visited a construction site around lunchtime. He saw his contractor and some of the construction laborers gathered around the fire eating lunch. The contractor struck a match and lit a cigarette. Naghiyev looked at him and said: "Don't come to work tomorrow. Go to the office and get your discharge ticket." "Why, Agha Musa?" asked the contractor in desperation. "There's a big fire in front of you, but yet you struck a match and used it even though it wasn't necessary. If you don't care about your own property, how can I trust you to take care of mine?" Naghiyev is said to have replied. Even though he was known for being a miser, Naghiyev was also a philanthropist who financed several important buildings and projects. For instance, he built a huge hospital, which now, since independence, bears his name - the Musa Naghiyev First Aid Hospital. He also helped finance the construction of Baku's water supply system - the Shollar Water Works. He helped to build several schools in Baku and covered the expenses for 25 Azerbaijani schoolboys who were from poor families. During the Soviet period, Naghiyev's contribution to Baku's architecture was almost forgotten. His contributions became valued only after Perestroika and independence. Baku's Wedding Palace, one of the largest mansions in the center of the city, was once the luxurious residence of oil baron Murtuz Mukhtarov (1855-1920). After a visit to Europe, Mukhtarov decided to build a residence for himself in the style of a French Gothic palace. Polish architect I. K. Ploshko oversaw the construction of the mansion in 1911-1912. Mukhtarov also built the Amirjan Mosque, the largest mosque of Azerbaijan, located in Amirjan, a suburb of Baku. The Russian government did not allow him to build such a large mosque in the center of Baku. Mukhtarov also erected a large mosque in the city of Vladikavkaz in the North Caucasus. Today, Mukhtarov's huge countryside villa is being used to house the offices of the Baku Botanical Garden. In 1899, Agha Bala Guliyev constructed a beautiful palace in the center of Baku. In contrast to the various European styles that his fellow oil barons were using, Guliyev chose to build his house in the Baku-Absheron architectural style, incorporating decorations from the portals of the Shirvanshah Palace. His is the only oil baron residence that was built in this style. Polish architect Skibinski designed the residence. Few Azerbaijanis are aware that Guliyev, known as a flour baron, initiated an early pipeline project for the transportation of Caspian oil to the port of Batum [Georgia] on the shores of the Black Sea. He founded the Baku-Batum joint-stock company and began to build the pipeline in 1897, finishing the work in 1907. The halls, ceilings and doorways of the oil baron palaces were filled with colorful, oil-painted murals. These paintings included various pastoral landscapes, flowers, animals, as well as traditional Muslim ornaments, scenes from the Bible and pictures of daily life from the late 19th and early 20th century. During the early Soviet period, the Bolsheviks painted over or destroyed thousands of these murals because they were considered to be "capitalist architectural extravagances." In many cases, they also tore down the beautiful molding, volutes and scrollwork found inside many of the buildings. They stipulated that a building should be as simple and modest as a worker's life. Only a few of the original interiors remain intact, including a room and hall in the Ismailiyya Palace and the Oriental Hall of the Taghiyev Palace. Today, it would be impossible to restore all of the paintings that were destroyed during the 70 years of Soviet rule. Some old photos and rare examples of artwork still survive, but that is all that exists today. Up until 1953, Soviet propaganda suggested that Azerbaijan's great architectural achievements were created under the leadership of "the Father of Nations" - Stalin. Certainly, many impressive, beautiful buildings were built during Stalin's rule. These include the Baku Railway Station, built during the early Soviet period using traditional Azerbaijani architectural forms. Consider also the great Government House of Azerbaijan in Lenin Square (now Independence Square), built by architects L. Rudnev, V. Munts and K. Tkachenko at the end of World War II. Captured German soldiers served as part of the workforce, leading the people of Baku to say: "This building is of high quality because the German soldiers built it. They are so precise and accurate!" 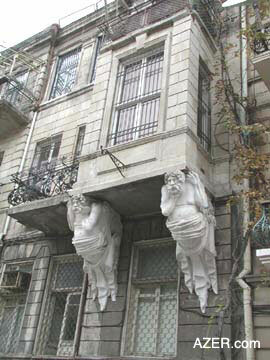 Azerbaijan's most famous architects during the Stalinist period were Sadikh Dadashev and Mikayil Useynov. They created masterpieces like the huge "Buzovnineft" building in Nizami Street, Academy of Sciences of Azerbaijan, Nizami Cinema, Hajibeyov Conservatory [now the Music Academy], Nizami Museum, Cabinet of the House of Ministers and Akhundov National Library. Majidov built the huge Lenin Museum [which now houses the Carpet Museum]. Azerbaijani architects Alizade and Madatov constructed the Azerbaijan Dramatic Theater. Despite the fact that some of these buildings were completed during the Khrushchev period, they continue to be known as "Stalin's Buildings" ("Stalinkas" in Soviet slang), owing to their large size, magnificence and beauty. During Stalin's era, a new type of building began to appear in Azerbaijan: the so-called Palace of Culture. The Palace was a special theater where workers and others went to be entertained by plays, lectures, chess matches, sports competitions and concerts of folk or Soviet music. Many of these imposing Palaces of Culture resembled ancient Greek temples like the Parthenon. In the 1920s, the Bolsheviks worked to create city gardens for workers. The Sabir garden adjacent to the Presidium of the Academy of Sciences was created, and the seashore boulevard was rebuilt and extended. Many of these gardens were filled with statues, including monuments to Marx, Lenin, Engels and Stalin as well as to great Azerbaijani poets and writers. Not all of these statues were aesthetic from a modern point of view. Huge plaster and bronze figures of the Worker Man and the Peasant Woman served as larger-than-life reminders of Communist ideals. The man held a large hammer, and the woman, a sickle, symbolizing the union between the workers and peasants of the Soviet Union. Both figures were athletic and muscular, with impassive, robot-like faces. Other statues depicted sportsmen and sportswomen with the slogan: "Don't be stupid, go out for sports!" Of course, after independence, all of these statues were dismantled. Living conditions during Stalin's rule were far from ideal. Most Soviet citizens had to live together in communal apartments with shared kitchens, toilets and bathrooms. Stalin's policy was to force different people to live together as a single family. Once Azerbaijan became independent, historians could write freely about both the merits and shortcomings of the Stalinist period of architecture. The Stalinist tendency to construct huge administrative buildings is now considered a form of megalomania. On the other hand, scholars do agree that many high-quality, beautiful buildings were built in Baku during the Stalinist period. When Khrushchev came to power, he denied all of the achievements of the Stalinist period of architecture. He declared that all 250 million Soviet people should have their own separate (as opposed to communal) apartments. To achieve this goal in a short period of time, houses were built very quickly with cheap materials; zero attention, it seems, was directed to quality and aesthetics. These ugly five-story buildings - "Khrushchovkas", meaning "Khrushchev's home" in Soviet slang - are still standing in Baku today. Sometimes people call these houses "Khrushoba", a combination of the Russian "trushoba" (poor, dirty hole) and the surname Khrushchev. When these cheap apartments were built, Khrushchev said: "Don't worry, these are only temporary homes! In 25 years, once the Soviet Union is the richest country in the world, these buildings will be torn down and replaced by real palaces for the working people." Even though these buildings were very poor in quality, Khrushchev's project was depicted as a great victory for Socialism. We now see these buildings for what they really are, but we must also remember that they enabled thousands of Azerbaijanis to leave the Stalinist communal homes and have their own apartments at last. According to Brezhnev, Khrushchev's attempt to provide all citizens with separate apartments in such a short period of time was "voluntarism" - that is, the aspiration to achieve unreal things. Brezhnev stopped building these cheap and ugly Khrushchovkas in Baku. Instead, five- and nine-story buildings of a much better quality were erected throughout the Republic. Heydar Aliyev, Azerbaijan's leader at the time, launched large construction projects such as the Gulistan Palace, the Republican Palace, the Exhibition of the People's Industry Achievements, the Central Committee of the Communist Party and the Parliament House. 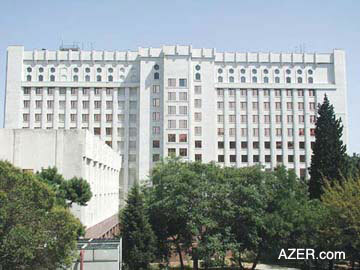 The Absheron and Azerbaijan Hotels went up near the Government House and Lenin Square. The Moscow Hotel also became famous as a place where wealthy foreigners from Europe stayed. 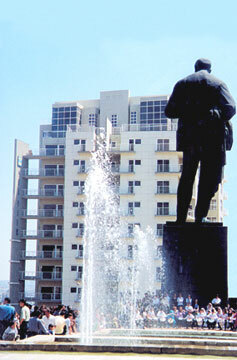 In general, the Stalinist style was replaced by more modern architectural forms. The old Parapet was turned into Fountain Square, with numerous fountains and sculptures. At the time, Azerbaijani books and newspapers emphasized the role of the Communist Party in beautifying Baku. Brezhnev himself repeatedly visited the city and said: "Baku is a beautiful city. It is a pleasure to live and work in this city!" His words soon appeared as a slogan on Baku billboards. Despite all of these achievements, Azerbaijani architecture suffered from the same problems that plagued the entire Soviet Union. Now that Azerbaijani is independent, we may freely write that the dwellings built during the Brezhnev era were also of comparatively poor quality. This was related to the corruption that spread throughout the Soviet building industry. Usually, the people who lived in a new house were forced to repair it themselves because it had been built so poorly. The architecture of Baku has changed significantly since Azerbaijan became independent in 1991. The international companies that have signed oil contracts in Azerbaijan brought with them a huge stream of investment. Many have chosen to situate their offices in the center of the city, some even in the medieval Inner City (Ichari Shahar). To reflect Baku's architectural environment, many of the new offices are being built in the traditional Eastern style and resemble medieval houses. Some of the older houses in the Inner City are being refurbished, giving the historic center of Baku a much cleaner, updated look. 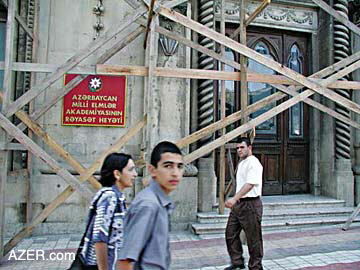 Nevertheless, many Azerbaijani architects are strongly against the new construction that is going on in the Inner City. They believe that the extensive building that is taking place there infringes upon the unique structure of the medieval city. Even though the walled Inner City, including the Maiden's Tower and Shirvanshah Palace, has had UNESCO World Heritage Site status since 2000, measures to protect it are either not in place or difficult to enforce. During the Soviet period, Baku wasn't exactly known for its comfortable, luxurious hotels. But now that there are a significant number of foreigners in the city, new hotels have been constructed. Two examples include the tall buildings of the Europe Hotel and the ISR Plaza. The old Nakhchivan Hotel has been reconstructed and is known today as the Hyatt Regency Hotel and Hyatt Towers; offices as well as residential apartments have been developed in the Hyatt complex. Baku's skyline has also seen the striking addition of steel and glass buildings, such as the National Bank of Azerbaijan and the Construction Bank. These modern buildings distinguish Baku from other Caucasian cities such as Tbilisi and Yerevan, which have retained much of their Soviet appearance. A Turkish influence is visible in the apartments that are rapidly being built and the new mosques that have recently appeared in Baku. These mosques are designed according to the Ottoman style, in contrast to the traditional Azerbaijani style. Usually, Ottoman mosques have slender, spear-headed minarets and a large cylindrical hall; a good example of this style is the famous Hagia Sophia [Aya Sofya or St. Sophia] mosque in Istanbul. Baku's most distinguished Ottoman-style mosque is the Turkish Juma [Friday Mosque], which was built several years ago near Martyr's Alley. Azerbaijan-style mosques are traditionally made of limestone and have wider, shorter minarets. Instead of glazed or painted roofs, the minarets each have a simple row of ornaments and quotations from the Koran carved in stone below the balcony. The 10th-century Muhammad Mosque in Baku is a bright example of this style. Due to the presence of so many foreigners, new shops and stores are also being constructed throughout Baku. Western-style supermarkets are replacing the old Soviet stores. One of the first of these to appear in Baku was Ramstore, which now has a chain of stores throughout the city. Many new restaurants, cafes and countless wedding palaces [restaurants specializing in weddings] are being opened in Baku as well. All of these buildings have added new features to the more traditional appearance of Baku. Farid Alakbarli, a frequent contributor to Azerbaijan International, is chief scientific officer for the Institute of Manuscripts' Department of Arabic Manuscripts. To read other articles by Farid, SEARCH at AZER.com. Also, several of his articles may be found in Azeri Latin at AZERI.org. For more information about Azerbaijan's architecture, see the Winter 1998 issue of Azerbaijan International (AI 6.4), entitled "Architecture and Development." Other resources about Azerbaijan's architecture include: "The Architecture of Ancient and Early Medieval Azerbaijan" by Davud Akhundov (1986); "Architecture of Azerbaijan from the 19th to Early 20th Century" by Shamil Fatullayev (1988); "The Architecture of Soviet Azerbaijan" by R. M. Afandizade (1986) and "Town Planning in Azerbaijan (13th-16th Centuries AD)" by V. G. Muradov (1984). From Azerbaijan International (9.4) Winter 2001. © Azerbaijan International 2002. All rights reserved.